GBP shows sluggish corrective growth today, correcting after a significant decline earlier this week, updating local lows of January 21. The reason for the emergence of negative dynamics, in addition to a fairly strong position of the dollar in the market, was the disappointing UK macroeconomic statistics. Industrial production in December decreased by 0.5% MoM and 0.9% YoY after a decrease of 0.3% MoM and 1.3% YoY last month. The GDP in December decreased by 0.4% MoM after rising by 0.2% in November. QoQ, the growth rate of the economy fell sharply from +0.6% to +0.2%. Investors are focused on the speeches of the heads of the Bank of England and the US Fed. Mark Carney can devote his speech to growing external risks amid uncertainty around Brexit. Jerome Powell may concentrate on the prospects for a less aggressive monetary policy regulator. Bollinger Bands in D1 chart demonstrate a stable decrease. The price range is expanding, freeing space for the development of the "bearish" trend. MACD preserves a steady downtrend with a signal to sell (located below the signal line). The indicator is preparing to test the zero line for a breakdown. 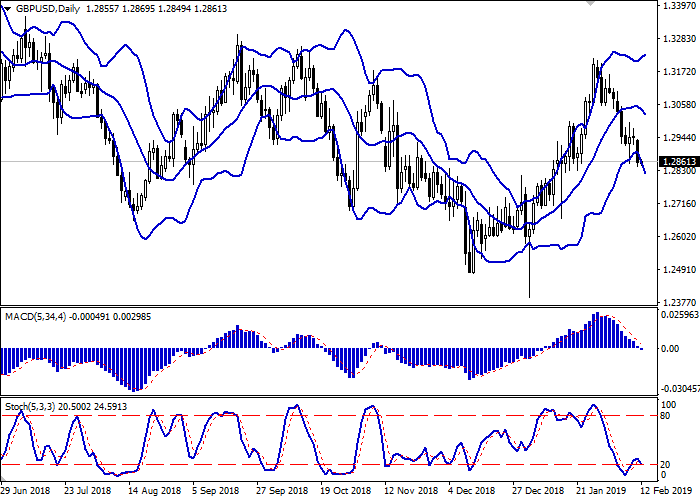 After a brief rise, Stochastic is reversing downwards again, still indicating oversold pound in the ultra-short term. The current showings of the indicators do not contradict the further development of the downtrend. Resistance levels: 1.2882, 1.2917, 1.3000, 1.3054. Support levels: 1.2829, 1.2796, 1.2758, 1.2700. To open long positions, one can rely on the breakout of 1.2882 or 1.2900, 1.2917. Take profit — 1.3000 or 1.3020. Stop loss — 1.2870 or 1.2850. 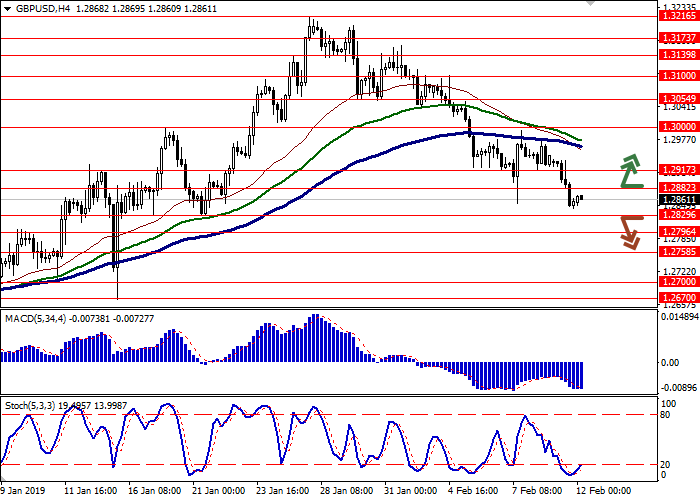 A confident breakdown of 1.2829 may be a signal to further sales with target at 1.2758 or 1.2700. Stop loss — 1.2870 or 1.2880.